The space efficiency of a regular bus is apparent. This all makes Golden Gate transit buses sound wonderful and “efficient” but it glosses over the reality that this form of transit is over three times as polluting as cars. The reality is that Golden Gate Transit Buses are incredibly energy inefficient in terms of energy usage and greenhouse gas emissions. But readers are instead focused on efficient use of freeway lanes. I base this on the American Passenger Transit Association Fact Book 2012 where it identifies Golden Gate Transit buses got an average of just 13.4 passenger miles per gallon in 2011, with commensurate emissions (since emissions are directly related to mpg). Meanwhile, in the same year cars and light trucks achieved 43.4 passenger miles per gallon. This uses an average passenger load based on the National Household Travel Survey, 2009, table 16. Golden Gate Transit buses therefore generate 223% more greenhouse gas emissions per passenger miles travelled (or over three times as much). Then looking at trends one sees that cars are steadily getting more and more energy efficient while transit is not. Just imagine – if everyone reads your article and we invest in more buses we can triple greenhouse gas emissions. Oh – but I forgot, thanks to Senate Bill 375 we can measure this as a huge reduction in emissions as we only have to measure the reduction in car and light truck emissions – since they’re evil and only they must be outlawed (even though they’re three times greener than this type of transit). Efficient use of freeway lanes is extremely helpful if you want to reduce traffic (and don’t want to, say, twin the Golden Gate Bridge and widen 101 to a 16-lane monster), and I think that is a good in and of itself, but I was actually expecting you to bring this up. Odd that APTA isn’t in sync with the National Transportation Database, which has GGT’s CO2 emissions at 45.1 passenger miles per gallon-equivalent of gasoline (pmpg-e). Was this in one of the appendices or the main factbook? Volvo makes a plug-in hybrid bus with 22 miles per gallon, which would get GGT up to 117.9 pmpg, or 103.6 pmpg-e. Under the NTD’s numbers, that’s 396.9 pmpg (348.7 pmpg-e). But is this bus legal in the US? Nope. National politics and trade restrictions make ensure that Volvo will not be able to sell this bus to GGT. Maybe if Gillig or New Flyer had a bit of competition we could get more fuel efficient buses, but until then we’re out of luck. And yes, a fuller post on fuel efficiency is in the works. I’m with you on the issue about Buy America. “Flex Fuel” seems to have been used as an RFP tool to limit government vehicle purchases to US built vehicles. How many of these vehicles ever use the Flex Fuel capability? But even when you look at the trends over many years transit efficiency is stagnating while car efficiency is leaving transit efficiency in the dust. Still not seeing anything specific to GGT on APTA. 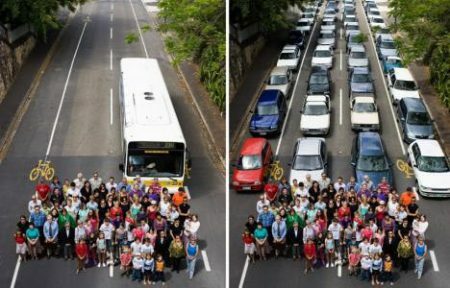 Regarding car vs bus efficiency: that is an issue with law and inventive, not something inherent to the mode. So you’re comparing the overall average fleet of buses vs cars… The fact of the matter here is that if GGT only ran the high demand routes, it would surely have a higher average passenger mile per gallon total than averaging the entire fleet because we inherently use transit as a social safety network. Additionally, you need to look at the specific demographics of Marin to determine actual passenger miles per gallon for cars. Given they probably are driving higher end cars than other parts of the nation and are likely to be more fuel efficient, transit still has it’s place. Plus if you add too much traffic to a limited capacity roadway, you get TRAFFIC! Anyway, a better comparison to match the article is how commuter buses compare to passenger vehicles. You can compare the entire fleet but that’s a whole different issue. This comparison is bogus. The measured GGT PPG is on buses that run solely on a congested corridor. It includes off peak runs that have low ridership. It includes the 10/70/80 which exist in large part as a social good for the transit dependent and should not be eliminated, but which do not attract the high ridership of the commute lines. Handicapping the commute line service with stats from a service which cannot be eliminated because it is for a social good is bogus. It would be like discounting the passenger miles per gallon of the car fleet by counting delivery vehicles which carry goods but don’t carry passengers. The 72 from Santa Rosa gets ridiculous passenger MPG, the buses have a load on the range of 40 passengers per bus, minimum, and do not use substantial gas making additional stops. You compare this to “cars and light trucks achieved 43.4 passenger miles per gallon”. This is a national average including cars and light trucks running on interstate freeways in the middle of nowhere. The cars and light trucks running on US-101 at peak rush hour are absolutely NOT getting 43.4 passenger miles per gallon. This is because even if you consider the personal vehicle to be an efficient vehicle in a vacuum, they don’t run in a vacuum, they run on limited road space that cannot be simply expanded. Thus they run in stop and go traffic, cratering the efficiency of the vehicle. And per all the protestations about the need to remove the carpool lane, we both know that the vast majority of those cars are running solo. How about them apples and oranges? The golden gate transit fleet includes hybrid buses and natural gas powered vehicles. I don’t know the fuel efficiency statistics but I am willing to bet that their efficiency positively dwarfs the SMART train even on a good day. My transit solution is more HOV lanes, freeway widening and better traffic management. BRT (Bus Rapid Transit) when operated on dedicated lanes and timed crosses are MORE efficient, and faster than light rail at a fraction of the cost. Virtually all of Golden Gate Transit’s fleet are standard diesel buses, with the exception of a couple of very expensive demonstration vehicles mandated by the California Air Resources Board. – A standard GGT bus getting 2.5 mpg with 40 seats could get a max of 100 passenger mpg; less with empty seats and more with standees, and much more with articulated buses. – SMART’s 2 car train sets will get 1.0 mpg and will have about 150 seats, so a max of 150 passenger mpg, less with empty seats and more with standees. – GGT’s existing ferry fleet gets an avg. of 0.12 mpg and has an avg. max capacity of 597, so a max of 72 passenger mpg. Actual has been around 14 passenger mpg. Ferries are a disappointing part of the transit network from a Ghg perspective. I still think that our Marin ferries are very worthwhile, but labeling them as “green” simply because they are transit does qualify as an oversimplification. Dave – consider the flip side of the story. The car’s convenience has been so successful that people far prefer it to transit. The car has enabled people to get to jobs. Suppressing the use of the car would be counter-productive. Spending more on transit has been *proven* over the last 30 years to consistently not switch people to transit, in fact the reverse has happened. For the Bay Area, we’ve thrown good money after bad building a wretched transit system. People have been, on balance, leaving it behind. BART, Golden Gate Ferry, and Caltrain are the principal exceptions. But it’s wrong to hold up the Bay Area as indicative of broader American values of transit when the rest of the country has seen record ridership. American trends should be the baseline to compare our region against, not the other way around. WOW.. David and Richard are all CARS CARS CARS. Suburban for sure. But the additional thought beyond passenger miles per gallon is exactly what you say. People are driving WAYYY too far, spending wayy too much time on the roads, and are basically forced to because of how cars have transformed and DESTROYED the urban fabric where transit THRIVES. GGT works about as well as Samtrans. IT doesn’t work well in most areas because everything is too far apart (suburban sprawl). OO get this, passenger miles per gallon still needs to factor total number of miles traveled!!! And then we have the infrastructure and everything else. My criticism of the region’s transit funding isn’t because I like cars. Rather, it’s because we haven’t funded good projects with our funding or have worked at cross-purposes with our funding. The result has been stagnant ridership when it should have been growing ridership, which would have been better for everyone. As Pedestrian Observations says, “For Walkability and Good Transit, and Against Boondoggles and Pollution.” The Bay Area is king of the boondoggles. It may come as a surprise to you, but not everyone has the same weird ideological bent that you do, most people prefer whatever mode of transportation is most convenient to them. Maybe the super-majority win of SMART should give you a heads up that your views aren’t exactly in the mainstream. Neil, do you need a history lesson? The Smart Vote was only won when Sonoma County was combined with Marin County. The original plan was twice the length and half the cost. It is a classic example of government bait and switch. A vote today would definitely go down to defeat. No one new that SMART would be the catalyst for massive urban expansion in Marin. Right, because Marin County “only” voted 58% in favor of Measure R. Only in the bizarre parallel reality that is our state in the post Prop 13 era would 58% support be construed by someone like you as a failure. And, news flash! Of COURSE SMART would not do as well today (particularly since it would once again need to meet the ludicrous 2/3 standard). Building infrastructure is really, really expensive, and really, really hard. Support for any public works project declines once you get past the happytalk of the project when it’s a proposal, and get on with the brutal reality of getting it planned, designed and built, with all of the hard choices that have to be made along the way. That’s true for rail projects, freeways, upgrading water lines, anything. But somehow it seems to be transit projects that always have to be voted on before they can be built. Freeways, on the other hand, not so much. People, like me Jake? You don’t know me. What are you referring to? I am referring to the law. Don’t want to cloud your ideology with reality. Why not look to innovation instead of dwelling on failed transportation schemes. There are some awesome vehicles available today like the 261 mpg Volkswagen. Jake, i’m glad you take this position. SMART may not seem smart in the short term. Costs and politics are always problematic in the short term, but TRANSIT and good TRANSIT at that are key for a thriving economy. I know people think cars cars cars because they supposedly dont cost “US” money, but that argument itself is just so wrong. There are just so many examples out there where transit is revitalizing cities. A bit of density, increasing mobility, and improving quality of life. Drivers dont give credit to bridges, and roads.. just their cars. Fact of the matter is that we all cant drive cars everywhere or else our world would be dominated by CARS! SMART will prove itself in time. Just like the new EXPO line in LA.. IN LA!!! the Car capitol of the world is investing in TRANSIT! and it makes sense. People will always have their options, but OPTIONS are what we need! The car has enabled people to get to take jobs 70+ miles away from where they live. Suppressing that would in fact be very productive. I ride GGT a couple times a month as part of my journey to my job. At 5 AM the roads are already packed in Petaluma as people driving from Sonoma County to San Francisco for jobs try in vain to avoid the traffic. From the window I see all sorts of dangerous behavior and more than my share of crashes caused by said behavior. Don’t you think you are being too unfair to tell people where they must work? Shouldn’t people have freedom of choice where to work? Just because you view your neighbors with distain because of their need for travel, you are not on some high moral plain. Many people commute to get AWAY from their work centers and to provide a better lifestyle for their family. This is America. Get used to it. Instead of peering out the window at your neighbors, why not get to know them better? This is precious. Shouldn’t people who choose not to have ridiculous commutes have the freedom to live in an environment not being ruined by car culture? And how am I supposed to get to know my neighbors when they spend all their non-working hours in the car? Don’t you think you’re being unfair forcing me to subsidize how they want to live? I thought this was America, not some socialist experiment.